It’s a difficult thing to admit, even to myself, but sometimes I do not want to cook. A recent virus kicked off my latest spurt of time out of the kitchen which was extended a few weeks by a trip up north and the guilt that ensued for not adding anything to Apples and Butter for weeks upon weeks. I have been here, quietly perusing your sites and finding so much inspiration, just not adding much to the conversation myself. This past weekend, the push I needed came in the form of a little red globe of perfect, first-tomato-of-the-season ripeness I found hiding at the back of one of my potted cherry tomatoes. The day I pull the first tomato of summer off the vine may as well be a holy day in my household. At the very least it’s the equivalent of a national holiday. The anticipation begins in March when I put the first seedlings in the ground and wonder why they don’t produce tomatoes the very next day. It’s a cruel, three-month waiting period until the flowers turn to green tomatoes and the green tomatoes ripen into voluptuous red globes that seem as though they will burst at the seems if left on the vine for one more minute. The cherry tomatoes I pulled off the vine needed a very basic preparation to let the homegrown tomato flavor shine through. I grabbed a fresh package of burrata out of the fridge and opened my new bottle of Valderrama olive oil (more about that another time) that was waiting patiently on the counter for the perfect first use. This was definitely it. With burrata and homegrown tomatoes as the star ingredients, the dish only needed a sprinkling of fresh herbs to finish it. Basil would be ideal, but since my bushes had not quite jumped into production, I settled for finely chopped parsley - a decent substitute in this situation. For a presentation worthy of photographing (though I would have gladly thrown everything together in a bowl and dug in with a fork) I shaped the burrata into quenelles, a football shape which is formed by moving the cheese back and forth between two spoons, smoothing the edges as you go. If you have no idea what I’m talking about, this, more detailed, explanation may be helpful. Wherever you are, I hope it’s warm enough that you too are enjoying the first homegrown tomatoes of summer. Place the burrata quenelles on four opposite sides of a plate (think north, south, east, west). 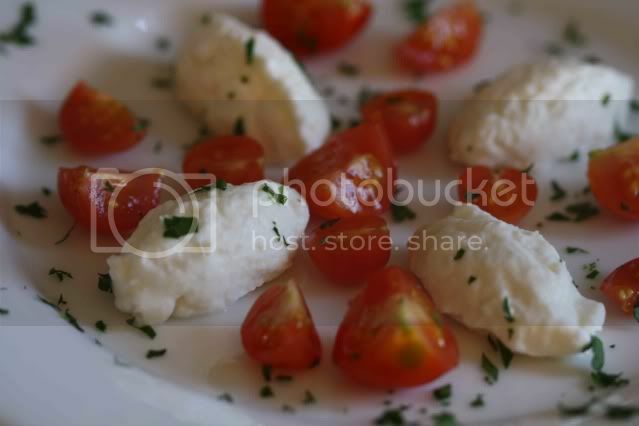 Slice the cherry tomatoes in half and arrange them among the burrata. Drizzle with olive oil and finish with a sprinkling of herbs and salt to taste. Try not to inhale everything in one bite. You don't need to feel any guilt at all and with the help of RSS we can pop back in whenever you have both the time and inclination to post. Glad to hear you are over your virus. Your beautiful tomatoes bring a reminder of warmer days ahead, a lovely echo of your 'first tomato' post last year. Following northern hemisphere blogs can be frustrating sometimes, but bookmarks help to store ideas til the season reaches us again. Hadn't heard of burrata before, Wikipedia put me right, but left me with the feeling I wanted to lick the computer screen for a taste! Look forward to your next post but please don't feel any pressure. Your clean, fresh style is a treat and like your tomatoes, your posts are worth waiting for. I've missed your posts, but am glad you feel better...and realizing that we all do this for fun rather than the big bucks, it's even more understandable. 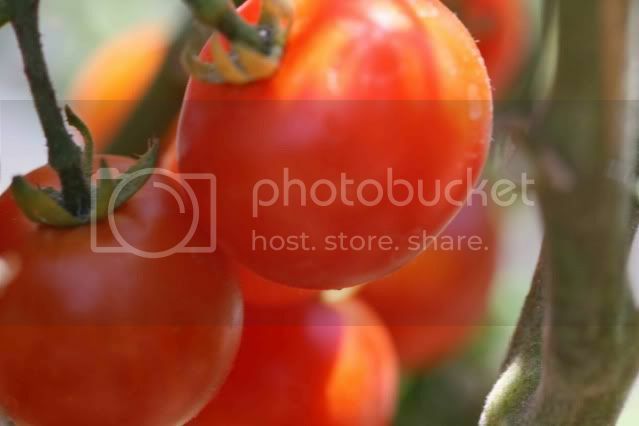 :) Your tomatoes look lovely and I also have enjoyed this salad with my own ripe tomatoes. There's nothing quite like it. Yum! I have some tomatoes in my garden just waiting to be used in a yummy dish like this! Thanks for sharinG! Jess - so glad to see you back!! buratta is the BEST--and thank you for bringing your beautiful pictures back (and so glad you are feeling better)--I am still on the market for a new camera and you are always an inspiration!!!! Glad to see you back and especially with a delicious dish. Your photos always amaze me. Lovely! So pleased to see you back - the delicious looking burrata and tomatoes are an added bonus. I'm glad to hear you are feeling better. It's good to have you back. The tomatoes in my pantry will be put to good use. Glad you are feeling better! What a great way to use fresh tomatoes - one of my favorite summer ingredients. No RIPE tomatoes yet in Omaha, but there are about 200 little green globes out back auditioning for their star turn across my plate right now. Can't wait to see what other ideas you give me for their performances! Glad you are feeling better. This dish looks absolutely great! Yum! 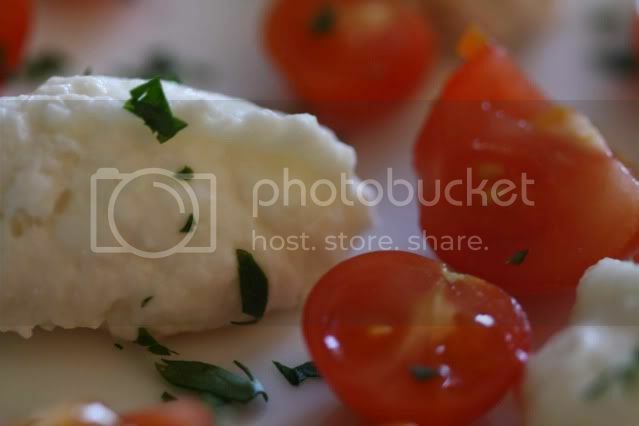 Burrata is one of my favorites...and I just happen to have some in the fridge. I've never tried to quenelle it but will use this recipe tomorrow. I am glad that you are feeling better,...This post is lovely: easy yet so yummie! I just had burrata for the first time at a new restaurant down the street, it was lovely! Your salad is beautiful. That's a beautiful summer salad! I'm jealous of the fresh burrata. I can't seem to find it locally. Ohh yum. Glad to see you're back! And I'm LOVING the looks of that combo... probably my favorite meal ever! MMM, Burrata is my favorite. We can't buy real burrata in Nashville, so I have to special-order it from Italy. Seriously. I've got to try and find burrata. I've only had it in restaurants and was totally inspired by it. I'm hoping our Italian market carries it. What a perfect summertime dish!